The ATCOs’ Branch had talked about adopting a charity for years; however it proved a little bit more difficult than we had first thought. Charities are often personal to the individual, and as a Branch we were no different. We needed to find one that we all could bond with and as such many were considered. Then, on January evening in 2010, a team from the ATCOs’ Branch Executive arrived at Lasham Airfield in Hampshire to meet with Mike Miller–Smith, the CEO of Aerobility, and with that our search was over and a friendship born. Our partnership with Aerobility was formalised when the 61st ADC adopted Aerobility as our Branch Charity in 2012. 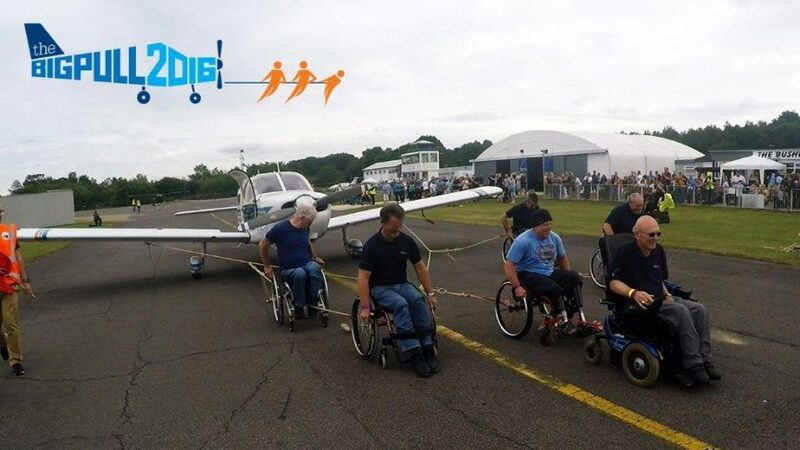 Aerobility is a registered charity founded in 1993 offering disabled people, without exception, the opportunity to fly an aeroplane. For some that amazing first flight is enough to change their outlook on disability forever, for others realising that the fantasy of flight is truly in their grasp changes their lives for ever. Some decide to continue their training, many all the way to securing a Private Pilot’s Licence, some even with an outlook to commercial flying. Aerobility also provides ‘experience of a lifetime’ trial flying lessons for as many terminally ill and disabled people as possible every year. Subsidised flying days for other disability charities, at-cost instruction and qualification flight training to disabled people are other avenues they offer. As a User Led Organisation Aerobility is run largely by disabled aviators for disabled people. Through various fundraising initiatives and careful management strategies we allow disabled people to fly for a fraction of the commercial rate. Aerobility also provide advice, knowledge and advocacy for disabled people who wish to fly, and is the representative body for disabled aviation within the UK. Aerobility has operating bases at a number of airfields in the UK. These include our headquarters at Blackbushe, at Tatenhill airfield in the Midlands, and a Prestwick in Scotland. We also fly from many other airfields on temporary detachment. With the help of sponsors and supporters Aerobility operates a mixed fleet of light aircraft, balanced for capability, most being owned outright, with others leased to suit demand. Our main training aircraft is the Piper Warrior 161, which is adapted so that it can be flown by people with disabilities. Even severely disabled people can be hoisted into the cockpit, using our specially developed hoisting techniques, and electric-robotic or manual hoists. We also have a PA32 Cherokee 6, a larger aircraft with more loading capacity which enables us to take larger wheelchairs, power-chairs and a hoist with us on our flights. This allows us to operate away from our usual bases without having to bring equipment by road. The do something ‘Big’ campaign orchestrated by the ATCOs’ Branch culminated in the first Big Pull at Goodwood Aerodrome on the 3rd June 2012. 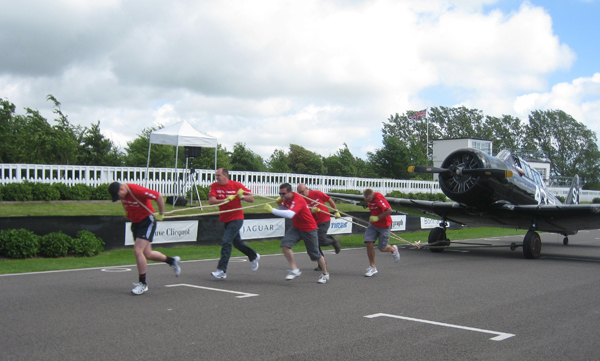 The centre piece of the day was a timed race where teams pulled a Havard aircraft along the famous Goodwood circuit. The event was keenly contested with the eventual winners, TC, beating their rivals from AC into second place. The work that year however didn’t stop there. In order to pay for the charity’s fixed-base PA-28 flight simulator (this is located at the main office at Blackbushe Airport) members of the ATCOs’ Branch and their friends officiated in the Global Flight Simulator Challenge. 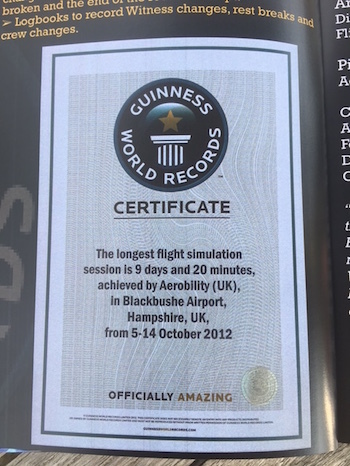 This was an attempt to ‘fly’ the simulator around the world and by doing so set a new Guinness world record. In order to ensure compliance with Guinness regulations, the ATCOs’ Branch supplied 2 witnesses at all times, 24 hours a day, in 4 hour shifts – we also provided the Air Traffic control! 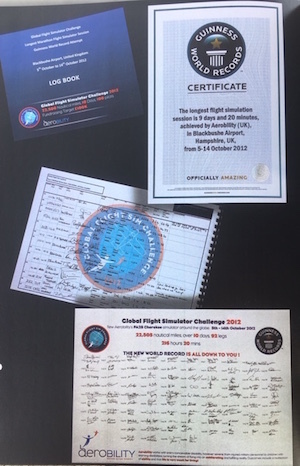 From the 5th of October through to the 14th of October 2012, 22,598 nautical miles in 92 separate legs were flown in just 9 days and 20 minutes with £100,000 raised and a new Guinness World Record set. The 30th of July 2016 saw Big Pull 2, the return, and a chance for someone to knock the TC team, current champions, off their perch. 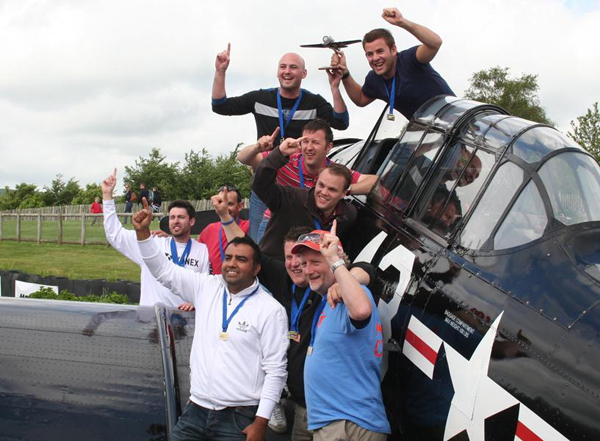 As part of the Blackbushe Air day, Aerobility HQ hosted teams from across NATS who took part in the event. Teams this time included the NATS executive, teams of controllers from AC and TC, and a team from HR. For the first time we also had a disabled team pulling in wheelchairs. TC again were victorious and more than £10,000 was raised for Aerobility. Over and above the charity events, members of the Branch and retired members continue to support the activities at Blackbushe, various events around the UK and particularly at the annual Aviators Ball in November. Both Paul Winstanley and Chris Edwards serve as Trustees of the Charity.